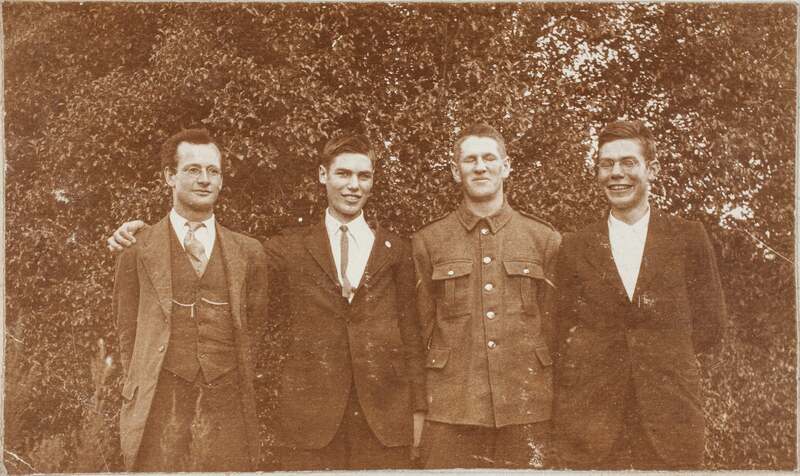 Robin Page, far right, is seen here with his younger brother Fred (second from the left) and two friends: Alf Paterson on the left, and Norman Richmond, in uniform. Fred, who was a schoolboy when Robin was in prison, cycled from his home in Papanui to Paparua each Saturday to visit him. Duncan McCormack, “Robin and Fred Page,” Voices Against War, accessed April 26, 2019, http://voicesagainstwar.nz/items/show/110.